The California State Legislature ended their 2016 general session on Aug. 31, and several new bills were passed that affect community colleges statewide, along with an updated state budget that raises funding to community colleges. Several of the Assembly and Senate bills passed will directly impact community colleges across the state, as well as their students and professors. Most bills will take effect Jan. 1, 2017. According to the updated Higher Education Budget Plan, the state increased the community college budget by $269.7 million. The budget plan also includes $283 million of Prop 98 funding, which comes from the state’s general fund, for community college maintenance and the purchase of instructional equipment. AB 2017, which creates a funding stream to help community colleges provide mental health services to their students, was lobbied last semester by the Life is Worth the Walk Club (LWW). LWW is an American River College club dedicated to mental health awareness and suicide prevention. Some of its members, along with their faculty adviser, ARC psychology professor Peg Scott, went to the state capitol in March to speak with state legislators about the bill. AB 2017 passed both houses uncontested, with a unanimous vote of 80-0 in the assembly and 39-0 in the senate. The bill now sits on Governor Jerry Brown’s desk, awaiting his decision to approve or veto the bill. In an email on Monday, ARC psychology professor and president of the Los Rios College Federation for Teachers, Dean Murakami, urged supporters of the bill to write letters to Governor Brown asking him to sign the bill. AB 1995 requires community colleges with any showers accessible to students (for example, in a locker room) to provide homeless students with access to those showers. 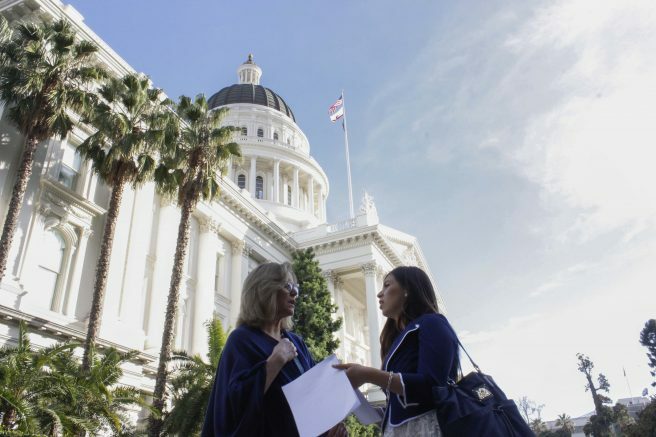 According to the San Jose Mercury News, members of the Student Senate for California Community Colleges, an organization that gives community college students representation at the state level, lobbied for the passage of AB 1995 on their own dime. The bill passed both houses and went to Governor Brown’s desk on Aug. 31, where it now awaits his signature. AB 1960 and SB 1379 work in conjunction to help guarantee part-time and adjunct faculty in the California community college system certain rights. Almost two thirds of community college faculty are part-time or adjunct, also known as “contingent” faculty. Contingent faculty often string together a living by teaching classes at multiple colleges. These “freeway fliers” sometimes spend more time on the road than in the classroom. Just 32 of California’s 72 community college districts currently have union representation for their contingent faculty. Los Rios Community College District is one of the 32, with the Los Rios College Federation of Teachers representing its faculty. AB 1960 and SB 1379 would bring the other 40 districts up to this standard. The bills will also guarantee certain seniority rights to contingent faculty and would guarantee a steady workload to those who have worked for their district for 3 or more years. Both bills passed in both houses, and have been ordered to enrollment. Once the bills are enrolled, they will be presented to Governor Brown for his signature. AB 2393 provides community college faculty and classified staff with up to 12 weeks of paid parental leave, and removes statutes which required the employee to have a certain number of hours worked with the employer to qualify for paid leave. The bill passed 57-22 in the assembly and 28-10 in the senate, and is also awaiting governor Brown’s signature. AB 2069 would require reporting of part-time faculty office hours, and would require districts to post on their websites the number of paid part-time faculty office hours worked, divided by the total number of part-time faculty office hours worked. This reporting would create a percentage showing the amount of unpaid hours part-time faculty are working, and lobbyists hope that it will draw attention to the issue and push legislators to provide further funding for part-time faculty office hours. Hannah is a second-semester student on the Current, where she serves as Editor-in-chief. She is a journalism major and plans to transfer after graduation to complete her degree and pursue political journalism. Be the first to comment on "California passes community college legislation"